Getting the right kind of furniture for your patio can be quite daunting nowadays, especially as there are so many choices available out there today. Besides, there are a lot of aspects you ought to keep in mind to make sure that you’re investing your money in something that’s worth the effort and every cent, of course. These range from durability to design and the amount of comfort that any furniture ideas for your patio might be able to provide you with. Let’s look at some of the essential factors that you have to consider when you’re in the market for a brand new furniture set of this kind. Both the quality of the craftsmanship and the material that the furniture pieces are made of can mean a lot in terms of the value that the product is capable of offering you. There is a broad variety of options in this sense. Outdoor furniture can be made from wood, wicker, plastic, or metal, and all of these have both pros and cons. Metal is great if you’re looking for a highly durable choice, but do ensure that the model you will select cannot rust. Wood is great-looking, but it’s not nearly as durable as metal, for example, because it tends to absorb moisture quite easily. And guess what? Life often goes in the way of you being able to get the furniture inside whenever there are showers announced in your area. Wicker is visually appealing and can be made from bamboo, rattan vine, or cane. Both resin and plastic furniture pieces are durable, to an extent, but they might not be so if they are too thin. Besides, we’ve all seen those distasteful and white plastic chairs before, so be sure to get one that resembles wood as best as possible. What about storage and proper care and maintenance? 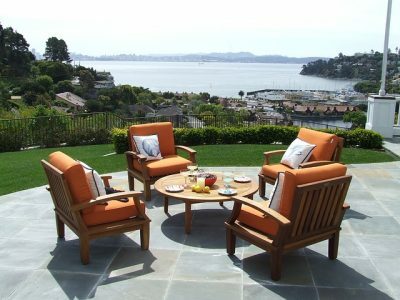 Your patio furniture needs to be designed specifically for outdoor use to make sure that it stands the test of time. But other than its durability, you should also consider the amount of convenience that it can provide. Are the chairs stackable and lightweight enough to be carried easily? Can you comfortably store all of the furniture in your home, or do you have to make an effort to make some room for it? These days, there’s a wide array of furniture sets that can be disassembled or folded with ease. Perhaps you should consider one of those. While it might be extraordinarily tempting to select the most sizable patio furniture you can afford, you need to understand that getting too many pieces might restrict your outdoor lounging space. How many people do usually come to visit with you? How big is your family? Are there folks that would enjoy spending pretty much all of their time outside of the house, therefore occupying a sofa or a chair constantly? Only you can provide the answers to all of these questions and choose the set number accordingly. Brought to you by our friend, Vlad.